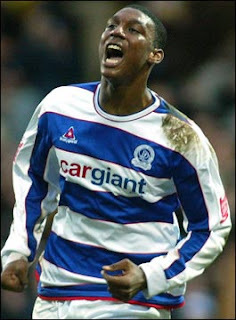 In what is unchartered territory for QPR in recent years, QPR's reward for beating Carlisle in Round 2, is a trip to Premier League, Aston Villa in Round Three. 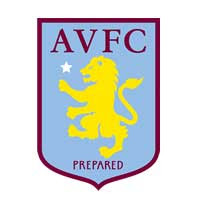 Villa enter the competition at this stage owing to their involvement in the UEFA Cup and the game will be played week commencing 22nd September. I thought we shaded it in the first half. I know it's only a point but it's an important point. It was two good football sides and they'll cause you problems but other than Dele Adebola's header we were fairly comfortable. I thought our defending was outstanding. We know we have quality players, but you also need resilience in the Championship. I don't know why he got booked in the first half. He throws the ball to the man; the man lets it go and its Ledesma's fault. I'll be having a look at the video. Their player deliberately jumped out of the way of the ball to make it look worse than it was. 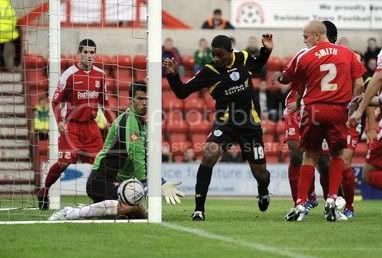 After that Emmanuel showed his inexperience with a silly tackle to get himself sent off. Dexter has been on his deathbed all week but he did very well and worked very hard up top on his own. 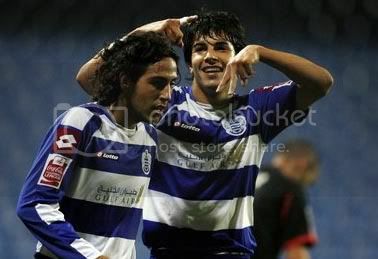 QPR: Cerny, Ramage, Stewart, Connolly, Delaney, Ledesma, Leigertwood, Mahon, Cook (Rowlands 54), Parejo (Agyemang 75), Blackstock. Subs: Camp, Gorkss, Balanta. 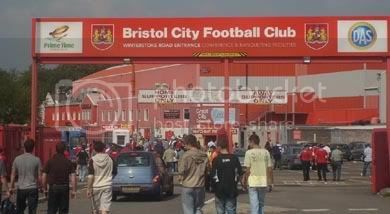 Rangers came away from Ashton Gate with a creditable point with a more that creditable performance. This despite playing the last half an hour with ten men following the sending off of Emmanuel Ledesma. Dexter Blackstock gave Rangers a deserved lead in the firt half and a well deserved goal it was too from the R's striker. City levelled it up before the break through yet another striker who seems to score customary goals against QPR, Dele Adebola. But, in truth, City would have been the happier of the two sides to be going in at half time at 1-1. 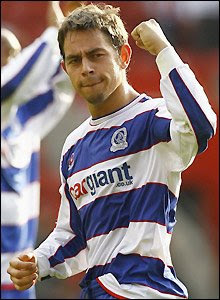 The second half started lively enough, but the final outcome was probably determined when the referee, who was without a doubt the worst we have encountered this season, decided to give midweek hat trick hero, Emmanuel Ledesma a second yellow card, leaving the R's to play the last 30 minutes or so with ten men. Although, Rangers held their own and continued to try and play football, City, as you would expect put us under pressure towards the end and would have claimed all three points but for a world class save from Radek Cerny, from Adebola's header. In summary, this was a very good result and performance from Rangers and I think most R's fans would have taken a point before the game. With Corp still on his sick bed (get well soon mate) and PK deciding against rushing around after a hard day's graft, it was just myself, California Hoop and Mrs California Hoop in attendance tonight and boy, I bet PK had wished he had made the extra effort now!! The Argentinian midfielders corner was headed home by Damion Stewart on 48 minutes to give the R's a deserved lead. Ledesma doubled the lead on 56 minutes after turning his marker before firing a left-foot rocket into the corner. From there on, it was the Emmanuel Ledesma show and on 63 minutes, Parejo's lay off found the hitman in space and he lashed it past despairing keeper Williams to make it 3-0. Ledesma completed the rout on 85 minutes after he cleverly chipped Williams following great work from Balanta, to complete a superb hat-trick. QPR: Cerny, Delaney (Gorkss 67), Stewart, Mahon (Bolder 67), Parejo, Rowlands, Ramage, Connolly, Cook Ledesma, Di Carmine (Balanta 67). Subs: Camp, Alberti, Ephraim, Ainsworth. There is not a lot more I can add this evening after witnessing a great second half's worth of football and one of the best hat-tricks I have seen at Loftus Road. 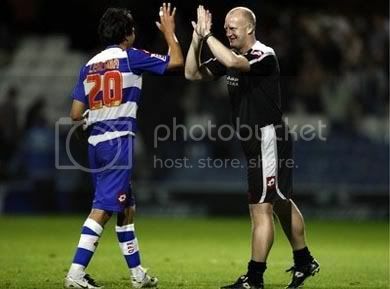 It's four wins out of five for Iain Dowie and QPR now and a place in the 3rd Round of the Carling Cup - Happy Days!!! Today marks the first anniversary of the death of QPR striker Ray Jones, who was tragically killed in a motor accident 12 months ago, after his car was involved in an accident in East Ham. He was just 18. Formely of Dog Chewed The Handle, Lee Van Sargeant and our very own, Gareth Ainsworth performed their own song as a tribute and in honour of Ray. I managed to catch the moving moment on video at a gig in Ruislip and would again, like to share with you all. I and indeed all friends and readers of Lofty Heights extends their deepest sympathy to the family and friends of Ray at this sad time. 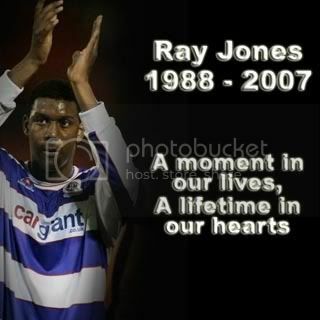 QPR did the memory of Ray Jones proud with a comfortable 2-0 win over newly promoted Doncaster Rovers. Dexter Blackstock and Emmanuel Ledesma were the scorers in the game that marked the year anniversary of the death of striker Jones who was tragically killed in a car accident. Anyway, onto the game which was a complete carbon copy of last weeks showing at Sheffied United as QPR turned in their best performance of the season so far. 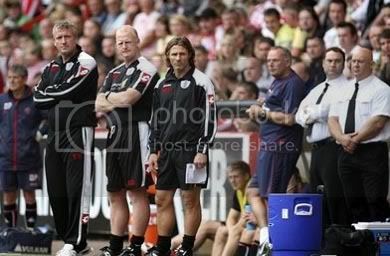 The visit to Bramall Lane will soon become just a distant memory, I'm sure. Rangers were ahead on just 5 minutes - Daniel Parejo floated over a free-kick that was stroked home by Dexter Blackstock who raised his black armband and kissed it, dedicating his goal to his close friend Ray - a very moving moment I must say! Parejo and Ledesma were bossing the midfield as Rangers continued to create chances. Parejo really should have had his first goal for the R's but headed narrowly over from close range. But the second goal wasn't long in coming and on 28 minutes - Stewart found Ledesma in acres of space and the Argentinian midfielder cooly slotted home his first goal for Rangers. Further chances fell to Stewart and Ledesma and despite some neat and tidy football form Doncaster, they never really threatened in the final third and that continued in the second half. Rangers were extremely comfortable against a Doncaster side who had come to Loftus Road in good form and although the second half wasn't as upbeat as the first, Rangers saw the game out well and could have extended the lead through substitute Balanta. Lofty's Man of the Match - I have struggled with this one with many good performances throughout. Gavin Mahon was oustanding on his return to the team and Daniel Parejo had a fine match in the heart of the Rangers midfield. Matt Connolly slotted in for the injured Fitz Hall and looked more than at home as centre back. But I just can't call a final result between the two so the award this week goes to both Emmanuel Ledesma and Dexter Blackstock. As mentioned, with this performance, Sheffield United is becoming a distant memory and this was the R's best performance of the season so far and a fitting tribute to the memory of Ray Jones. QPR got a huge reality check as a Billy Sharp hat trick gave the Blades an extremely comfortable win at Bramall Lane on Saturday and brought the R's back down to earth with a massive bump!! The day started well enough with myself, PK and the returning Darren, setting off just after 10am and despite a minor hold up on the M1, arrived in plenty of time for some pre match food and drink. Due to QPR's raising their profile, such to speak, instead of finding a pub, we thought we would do what we did last year and take in the excellent 'Hellas Cafe Bar', in which we enjoyed a bistro type lunch and some cold bottled beers before the short walk to the stadium - which from there on in, the day went downhill, rapidly. There is no way to sugar coat it, this was a shocking performance from Rangers, who went a goal behind on just two minutes - Halford hurled in a long throw and striker Darius Henderson flick-headed the ball into the danger area to find Sharp, 'unmarked' to stoop and place his header out of Radek Cerny's reach. Ten minutes later and it was 2-0 - Mikele Leigertwood dithered and veteran Gary Speed stole the ball. He angled an ball for Sharp who let's be honest, after a big money move fromScunthorpe last year, couldn't hit a barn door from the inside last season! He raced into space leaving Rangers trailing and rifled a cool shot past Cerny and Rangers went into the break fortunate to be just 2 goals down. Six minutes into the second half and it was game over - Sharp finally added his third goal when he stabbed the ball in from close range after Cerny flapped at a Tonge corner. 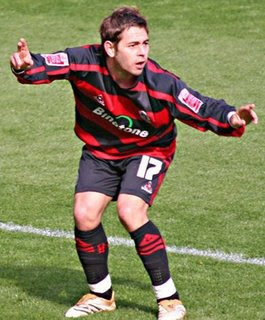 The best it got for Rangers was during a brief 20 minute spell, when Ledesma struck the Blades post from outside the box and Blackstock was denied at the rebound by a great tackle from Ehiogu. QPR: Cerny, Delaney, Hall, Leigertwood, Parejo, Blackstock, Gorkss, Connolly, Cook (Alberti 80), Balanta (Di Carmine 46), Ledesma. Subs: Camp, Stewart, Mahon. Lotfy's Man of the Match - N/A!!! Don't get me wrong, Sheffield United are a decent outfit and this was always going to be a tough game for Rangers. But, as mentioned, this was a HUGE reality check for the R's and many questions could be asked of Iain Dowie's team selection against an as always, physical Sheffield United side? The back four looked like they had never met before and plenty of work needs to be done before the visit of Doncaster to Loftus Road. Personally, I am not worrying just yet as with all the expectation surrounding the club at the moment, this heavy defeat may well do us some good in the long run. One of Dowie's favourite quotes is 'bouncebackability'. Let's hope we see some next Saturday! No, your not seeing things, QPR have been in a televised draw for the Carling Cup Second Round and have been drawn at home to Carlisle United. 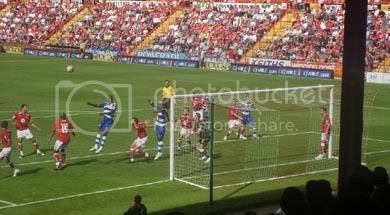 QPR secured a shock 3-2 cup win against Swindon Town in the first round of the Carling Cup on last night. With Corp still on foreign soil and PK stuck at work, PK's bro, Steve joined myself for what should have been a relatively straight forward midweek journey to the County Ground. Which it was, until junction 13 of the M4 and the delays meant we missed the first 20 minutes of the game. Walking to the ground, there were plenty of oooo's and aaar's coming from the home end, leading us to think we could be in for a tough night. Thankfully, we arrived in plenty of time to see Angelo Balanta give the R's the lead from close range on 33 minutes. But sadly, by the time I had written the texts to the gang not in attendance, I was quickly editing it to say that Swindon had levelled through Cox. 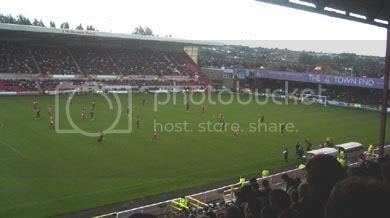 And, if the Swindon PA announcer wasn's annoying enough after the goal, he was even more so after 'Billlllyyyyyyyyyyyyyyyyyyyy Payyyyyyyyyyyyynteeeeeeeeeeeeeeeeeeer' gave the home side the lead on 42 minutes and many R's fans were scratching their heads in wonder of just HOW, we were losing this match. 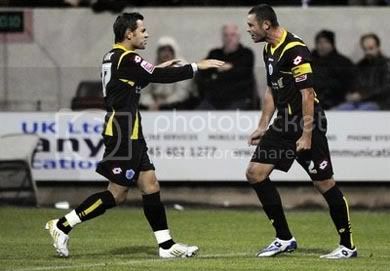 Well, myself and Steve thought we had done so well, getting to the ground when we did and NOT missing any goals. So at the very least, we thoroughly deserved a half time beer!! So that was eagerly consumed and enjoyed and a quick visit to the gents before the second half, then - 'YEEEEEEEEEEEEEEEEEEEEEEEEEEEEEEEEEEEEES' is what is heard from above. We arrived back to our seats to find lots of smiling faces and Rangers level through Dexter Blackstock. After watching the Carling Cup highlights on ITV1, we saw it was hardly the 'goal of the season' contender that many had teased us with, but a fine goal all the same as the Cook/Blackstock partnership was back in force. Nine minutes later and Rangers were ahead and yes, we saw this one!! Captain for the night, Damien Delaney fired home from ten yards with a cool finish after Ledesma's corner was only half cleared. Despite plenty of pressure for the home side, Rangers looked the bigger threat coming forward and even after 5 minutes of time added on, the dreaded extra time didn't come and Rangers held on to amazingly, win a Cup game!!! QPR: Camp, Delaney, Stewart, Leigertwood, Parejo, Blackstock (Di Carmine 69), Gorkss, Connolly, Cook, Balanta, Ledesma (Alberti 78). Subs: Cerny, Agyemang, Bolder, Ramage, Ainsworth. Lofty's Man of the Match - a few contenders for this one with fine performances from Parejo and again, Ledesma. But last night's award goes to returning defender, Matt Connolly who did the work of two defenders last night following a poor performance from Damion Stewart. So, after an easy enough journey home, I now sit here writing this, knowing I will be back on here later to report details of the 2nd Round draw, what a good feeling that is!!! Fitz Hall scored twice and then missed a penalty as QPR came from behind to beat Barnsley, as the season started with a win at Loftus Road. How good it is to be back!! Okay, well we had a sneak peek at the new look Loftus Road at last weeks friendly with Chievo, but gladly, things seemed a lot more organised today. For one reason or another, the gang all arrived at different times and at different places - with Corp in Majorca, but with persistant rain all afternoon, it seems he has made the right decision? But of course, he is missing football and we arrived at our seats eagerly awaiting the kick off and indeed, the new season. Anyway, enough of that and onto the game and the expectant crowd were silenced when Iain Hume put Barnsley ahead after only four minutes. Rangers had started nervously, no more so than debutant keeper, Radek Cerny. But for a stupid minority of R's fans to start chanting 'there's only one Lee Camp' after only 12 minutes of the game was outrageous, if not disgraceful!! After the shaky start, Rangers got themselves back on level terms on 29 minutes - Barnsley keeper Luke Steele parried Emmanuel Ledesma's free-kick into Hall's path and he bundled the ball home at the second attempt after his first effort came back off the bar. 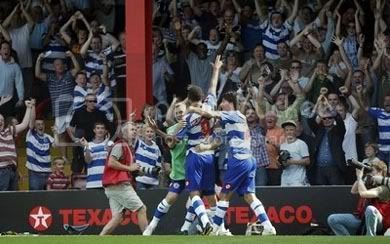 Just two minutes later and Loftus Road erupted - after Barnsley failed to clear a Lee Cook corner, the ball dropped to Hall near the edge of the area and the centre-back brilliantly hooked it back over his shoulder and into the far corner of the net to give the R's the lead. So, the season starts with a win and a reasonably good performance. There were a good few negatives, especially in the first half but plenty of positives also, with Ledesma's performance, Hall's goals and a very solid display from Gavin Mahon in midfield. Daniel Parejo got a twenty minute run out, which is hard to judge any player, but enough was seen in that time to suggest he is a fantastic signing!!! It must also be remembered that the R's were starting the season without the injured Vine and Buzsaky, the suspended Stewart, Di Carmine and Captain, Martin Rowlands who was ridiculously sent off in the last game against West Brom last season. But I saw enough today to feel that this could be a very exciting season with a lot more to come from these players. But, in a press conference today, QPR have announced the signing of Real Madrid starlet, Daniel Parejo on a season long loan. Rangers have beaten off stiff competition from a number of Europe's top Clubs - including Arsenal, Deportivo La Coruna, Espanyol, Getafe and Villarreal - for the young starlet and with all due respect to the players signed so far, this is the first real example of our wealthy owners flexing their muscles in the transfer market. Flavio Briatore said: "We are delighted to have agreed a deal to sign arguably the hottest prospect in European football. This is an incredible coup for Queens Park Rangers. 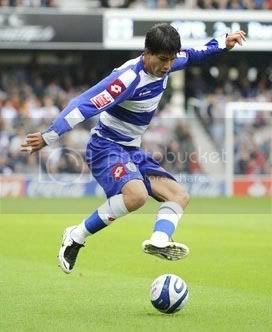 "I am eternally grateful to Ramon Calderon for giving QPR the opportunity to sign such a talented young player. Daniel is a great, young talent and we are looking forward to welcoming him to the QPR family. Iain Dowie said: "Daniel is a special talent. He's one of the stars of their academy, he gets it and gives it and is the link man we've been looking for. "It shows the benefit of having Flavio Briatore's contacts and we're indebted to him and his relationship with Ramon Calderon that we've managed to bring in one of the brightest young prospects in Spain." 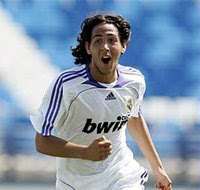 Daniel Parejo said: "I am very happy to be coming to London to play for QPR. When Madrid told me I could come here on loan I and my family were very excited. I had a very nice meeting with Mr Briatore and he has great ambitions for this club." 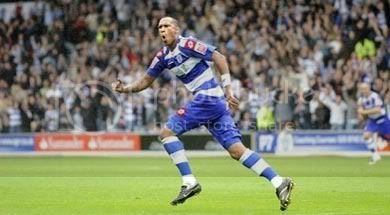 GOOD LUCK DANIEL and WELCOME to QPR!! 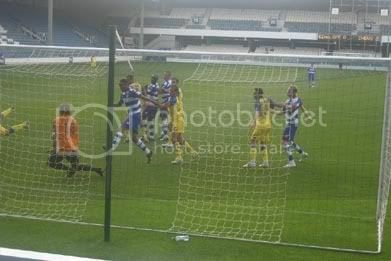 QPR ended their pre season campaign with their 3rd succesive defeat against Serie A new boys, Chievo Verona, in what was largely a disappointing match at Loftus Road. Well, on arrival, the first port of call was the Club Shop, or 'Superstore' as it's now called. It's basically, had a refit. It's the same shop, the layout is a bit better and now they have much welcomed air conditioning. It was also evident around the Stadium, that whoever has supplied QPR with blue and silver paint, has made a right killing!! So far, so reasonably good, but we were then eager to enter the Stadium and see our now 'Gold' seats in the Upper Loft. Apart from more splashes of silver paint, nothing much has changed. 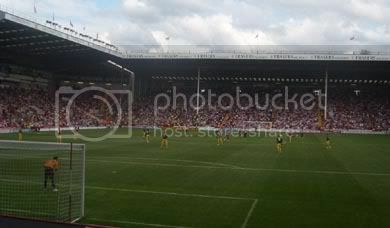 The Stadium as a whole, looked good with a new coat of paint and a big screen has been put up on top of the away end. Now, it was only a matter of time before we got one of these as our old scoreboard is not only a bit dated, but is really on it's last legs. The thing is, where our seats are, at the back of the stand, means that the long wait and excitement means nothing at all as that we will be able to see absolutely nothing of the new addition. Anyway, moan over and onto the game, which as a whole was a typical friendly and a bit of a disappointment. However, Chievo looked very good and passed the ball around very nicely and the R's, playing a weird looking system with a lone striker, struggled to keep up with them. However, Rangers were denied a lead midway through the half when referee Howard Webb, ruled out Damien Delaney's header for a foul by Fitz Hall. Cheivo then went down the other end and scored through Bogdani following some neat passing. Onto the second half and just as Iain Dowie changed Rangers back to a more conventionall 4-4-2 system, Chievo doubled their lead through Bentivoglion who fired home from the edge of the box as Rangers were caught napping by a reasonably simple, set piece. With 20 minutes to go, Rangers got back into the game. Alberti was bundled over in the box and the referee, quite generously I must say, pointed to the spot. Following a tangle with Ledesma to get the chance to take the kick, Dexter Blackstock sent the keeper the wrong way - at the second time of asking as Howard Webb had ordered a retake after the first penalty was saved. QPR: Cerny (Camp 85), Ramage, Delaney, Mahon (Bolder 76), Hall, Gorkss (Stewart 77), Agyemang, Leigertwood (Ainsworth 77), Blackstock (Di Carmine 73), Balanta (Alberti 59), Ledesma (Rose 83). 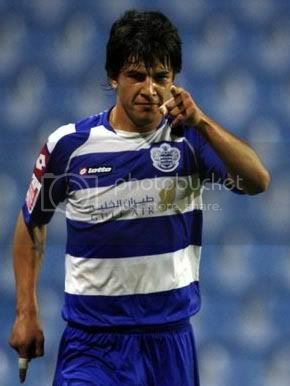 QPR have today signed former winger, Lee Cook on a season long loan from Fulham, with a view to a permanent transfer. Rangers were forced to sell Cook a year ago due to the financial position at the Club, but have been trying to get him back ever since - this despite the continued obstacles put in the way by Fulham. 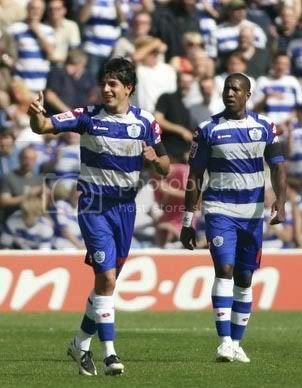 It must never be forgotten that Cook donated his signing on fee to help QPR's once precarious position. “I’m absolutely delighted to be back. Once it became clear I could leave Fulham there was only one club I wanted to move to. I had a great rapport with the supporters here in my previous spells and I’m looking forward to playing in front of the Loftus Road faithful again. I’ve spoken to a few of the lads recently and there’s a great belief that we can achieve something this season. The gaffer has made some astute signings over the summer and as a QPR player and a QPR fan I’m absolutely buzzing ahead of the new season"